The two-tier approach enables regional community land trusts to scale up operations and infrastructure with centralized services for local grassroots community land trusts. It supports centralized administrative services, technical assistance and financial controls, while maintaining an open, democratic organization and leaseholder participation. Because the two-tier structure is defined by the IRS, it has a standardized legal and financial framework that makes it easier to adopt and manage. This IRS structure commonly enables education and religious institutions to maintain their status as a nonprofit charity while owning income generating assets, such as real estate. Only a 501(c)(3) charity may form a subsidiary 501(c)(2) asset holding company, and the (c)(2) must give all income after expenses to the (c)(3). The charity must control the holding company, and the holding company may not conduct business independently of the charity. More on these rules may be found on the IRS website. Berkshire Community Land Trust articles of incorporation and bylaws lay out the community land trust framework for the two-tier model. Our approach is to scale up to serve our county with centralized services supporting new local community land trusts. Berkshire Community Land Trust has received its IRS determination letter as a 501(c)(3). In 2018 the Community Land Trust in the Southern Berkshires received IRS approval to become a 501(c)(2) title holding company on behalf of the Berkshire Community Land Trust. The chart below explains the role and responsibilities of the tier-one regional 501(c)(3) CLT as distinct from the tier-two local 501(c)(2) CLT. The mission of the tier one 501(c)(3) CLT is education and fundraising for the acquisition of land. 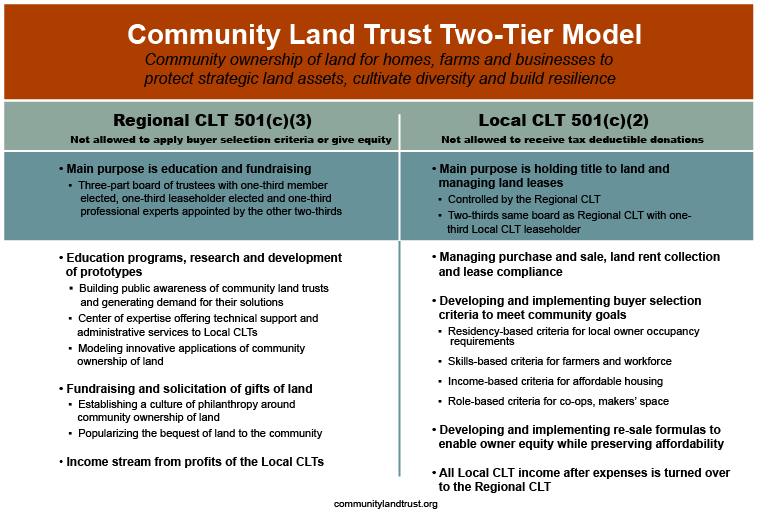 The mission of the tier two 501(c)(2) CLT is managing community-owned land. This model enables the charity to develop a culture of philanthropy around community-ownership of land, while also enabling the holding company to lease land for a wide variety of purposes that support community development. – Role-based criteria for import-replacement businesses, co-ops, etc.